Introducing the 2019 Niro, the first of its kind. The all-new Niro is making waves as the most stylish and fuel-efficient hybrid vehicle on the market. Offering an EPA-est. 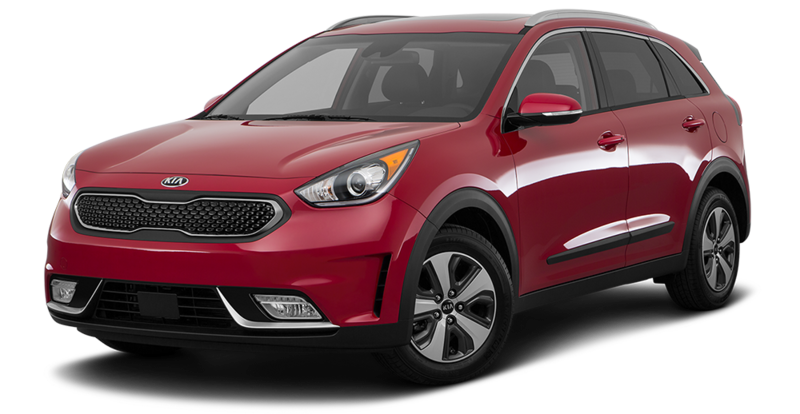 50mpg combined and near 600-mile range, the Kia Niro has literally broken the record for the lowest fuel consumption driving coast to coast! With its high efficiency 1.6L GDI engine, this hybrid crossover offers optimized fuel economy without sacrificing style. With a wide body and athletic stance, The new Niro boldly stands out from the rest. Inside, it offers more headroom than the Honda HR-V and more interior space than the Prius, as well as available leather seating and heated steering wheel! The Niro was made for absolute comfort. Quirk Kia of Manchester makes every effort to present information that is accurate. However, Quirk Kia of Manchester is not responsible for any errors or omissions. Picture may not represent actual vehicle. 0 cash down offers require only fees due at signing, KMF lease acq. fee, dealer doc fee, tags and first payment. All pricing includes all available rebates including Military Appreciation, Quirk Trade In Assistance, Kia Motor Company Rebates, Kia Motor Finance Rebates, and Quirk Discounts. Pricing based off Tier 1 Lease score, 720 FICO score with approved credit with KMF and 10K miles per year. 0% financing, in lieu of certain rebates, requires approved credit with KMF, and can not be combined with advertised pricing. Various offers can not be combined. All New 2019 Stinger, Cadenza and 2020 Telluride pricing also includes an Owner Loyalty/Competitive Bonus rebate, which buyers must qualify for. Residency restrictions apply. Must trade a 2010 or newer vehicle. Tax (where applicable), title, registration, and doc. fees are not included in vehicle prices. Dealer installed options are additional. Documentation fee of $399 is not included in price of Terms and conditions . **With approved credit. Terms may vary. Monthly financing payments are only estimates derived from the vehicle price with a 72-month term 3.9% interest and 30% down payment. Please verify any information in question with Quirk Kia of Manchester by calling us at (603) 505-8870 or by visiting us. *Number of views in last 30 days Based on 2019 EPA mileage ratings. Use for comparison purposes only. Your actual mileage will vary depending on how you drive and maintain your vehicle. Stock#KS3486. Sale Ends 04-30-2019.